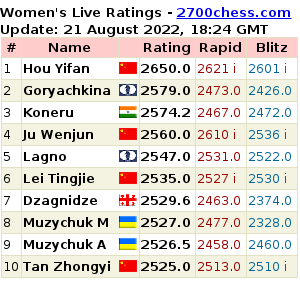 In Round 5 all three encounters between the leaders at the European Individual Women's Championship finished decisively. Now three head the field: Dzagnidze (Georgia), Zhukova (Ukraine and Gunina (Russia). Here we collected the decisive moments in the games of the leaders. At this point Black has neutralized White's first attempts to grab initiative and the position is overall acceptable. 22...Qc6 (seems as absolutely not an obligatory move 23.Be4 Qxe4 24.Qxe4 Nxe4? (correct was 24...Bxe4 25.Bxe7 Nd3! 26.Rc7 Ra8 and White hardly has any advantage) 25.Bxe7 Rc8 (maybe stronger was 25...Rb8) 26.Rxc8+ Bxc8 27.Nxa7 Bd7 (the knight is cut out but it's not an unsolvable problem) 28.f3!, and White converted an extra pawn (0-1, 41). 20. f6! (a typical pawn sacrifice for maintaining advantage) 20...Bxf6?! (White's task is harder to achive after 20... Re5 21. Qe2!) 21. Rf5 Re6 (or 21... Re5 22. Raf1 Rxf5 23. Rxf5 Qe7 24. Qf1!) 22. Raf1 Qe7 23. R1f3?! (missing an objectively better way of carrying out an attack - 23. e5! Bxe5 24. Bxg5 Qd7 25. Qh4!, and Black collapses) 23... Bxc3? (steadier was 23... g4!, with 24. Rg3 Be5 and 25. Rxg4+ Rg6 idea or 24.hxg4 Be5) 24. Rxg5+ Rg6 25. Qxc3 with a decisive advantage for White which was soon successfully converted (1-0, 34). 26. Rf1?! (white has more more chances to escape after 26. 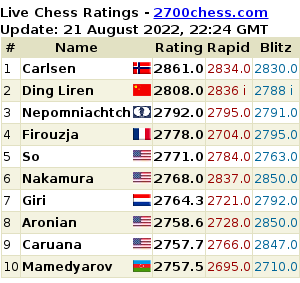 Qf3!) 26... Qh2+ 27. Kf2 Rh4! (but not 27... Rf8+ 28. Ke1) 28. Ke1 (28. Qg3+? would get a check in reply 28...Rf4+) 28... Re4+ 29. Kd1 Qxg2 with a winning position for Black (0-1, 49). From other noteworthy games Kashlinskaya crushed Videnova in 26 moves. Two other Russian players Girya and Kosintseva Tatiana also won their games. Check out 5th round games.